Dr. Elena Martinez is a Professor in the Department of Family Medicine and Public Health at UC San Diego. 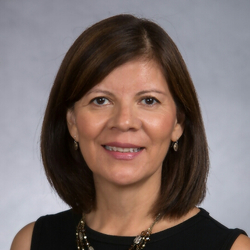 Dr. Martinez’s research interests in colorectal cancer prevention began during the conduct of her doctoral dissertation and extended into her post-doctoral studies at the Harvard School of Public Health. She has published extensively in areas of epidemiology, molecular epidemiology, and cancer prevention. Her research currently focuses on breast cancer in Hispanic women, with a prominent leadership role in the Ella Binational Breast Cancer Study. In addition, she is a key member of the original investigative team that implemented a large Gates Foundation-funded consortium in six countries in Latin America focusing on Helicobacter pylori eradication and gastric cancer prevention. She is currently Co-leader of the Reducing Cancer disparities program at the Moores Cancer Center. Dr. Martinez was a recipient of the 2013 Women Who Mean Business Award from the San Diego Business Journal. In her free time she enjoys running along the beach and Balboa Park and likes to travel with her husband.